Immerse yourself in Japanese history and culture, during this 6.5-hour exploration of the temples, shrines and attractions found in the country’s former capital city of Nara. Spend a few hours discovering this historically significant capital, first established in the 8th century, as you admire its wealth of important religious sites and a one-of-a-kind deer park nearby. Start your Nara trip with a pickup from select hotels and after your pickup, travel by rail from Osaka to Kyoto, where you’ll transfer to coach bus for the 1-hour drive to Nara to begin your excursion. The city of Nara was founded in 710, when it was designated as the country’s first permanent capital. Nara, or Heijo as it was then known, was home to many of the most important Buddhist monasteries in the then-nascent Japanese empire, which made it a key center of political and religious power. As Nara’s power and influence grew, the city became a threat to the government, leading the country’s rulers to move the capital to Nagaoka in 784. Despite this shift in fortunes, Nara retains a wealth of important historical sites, including some of Japan’s most important Buddhist temples. Stop by Nara’s Todaji Temple to start your trip. This magnificent edifice, constructed in the 8th century, is among the country’s most important religious buildings. Explore the temple’s Daibutsuden (Great Buddha Hall), one of the largest wooden buildings in the world, along with its immense bronze Buddha statue, which are just some of the treasures to be found in this incredible attraction. Continue your Nara trip with a visit to its famous deer park, a unique 1,250-acre preserve where more than 1,000 tame deer freely roam. Admire these gentle creatures as they graze and wander the park, and stop to purchase special deer food, which the animals will gladly eat from your hand, if you wish. 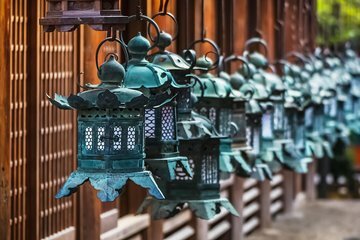 Finish your discovery of Nara at the Shinto shrine of Kasuga, a serene site that features a collection of more than 3,000 stone and bronze lanterns. Hear an overview of the site from your guide as you stroll the shrine’s outdoor pathway. After leaving Kasuga, return by rail to Osaka’s Kintestu Namba Station, where you’ll make your own way back to your hotel. Tour guides were great but the content and time was lacking. Almost half of that time was commuting. The tour itself was part of a bigger tour. Kasuga wasn't fully explored due to time. Only about 3 hours of the tour were sight seeing About 2:15pm to 5:15pm. It's hard to recommend because of it. Specifically joined this tour because I wanted my son to be able to see the famous deers of Nara. The dears did not disappoint, they were actually a bit aggressive specially if they know if you have a biscuit in hand. :p This tour is composed of a visit to a big buddhist temple and to a very serene shinto shrine. Both great and interesting, there were deers on both places. Our tour guide Michiko, was very informative and shared many facts and stories about the places we visited and things we saw along the way. Trip could have been better if there is more time given at the locations. Co-ordination amongst the tour leaders and local co-ordinators were good and with vast experience. Some amount of time were spent on the co-ordination along the way and that ate into the time allocated for sight seeing. 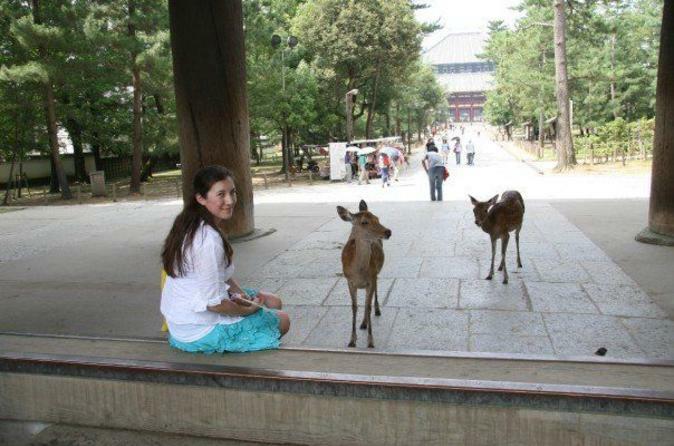 Nara is a great place and I would not have wanted to miss it. The tour I felt was way too large. Plus we had to go to Kyoto to pick it up. I would have rather had one leave from Osaka directly to Nara. This is a great afternoon but most of it is spent travelling from Osaka to Kyoto. I would only recommend this tour if you are staying in Kyoto. The temple and shrine are beautiful and he grounds spacious with lots of deer - that are a bit smelly! Worth it none the less to see some traditional buildings! The tour guide was more focused on keeping time and other logistics requirements where to meet, where the bus is parked, maintaining order, keeping quiet, etc...., rather than sharing insights about the temples and shrines. I enjoyed this tour very much. The tour guide was informative and timing was on the spot which is always the case in Japan!. However, it was a little tiring to make the trip to kyoto first then only to nara. This is because there are others who join this half day tour Nara having completed their half day tour in kyoto itself. Whilst it works well for them, it doesnt for those who only join the Nara tour. The deer park was amazing, the half day trip was a good length to see a couple of amazing sites.